Starts clicking in weddings with the nickname of "Fran", wasthe year 1985 and is maintained for five years clicking inthese. In 1986 already resides on the two premises. T hisyear also takes contact with several radio stations and inthe year 1987 already three musical programs varied largeaudience in her area. Years later creates with twocolleagues Radio Laser, which in 1992 was already threedelegations, Casas Ibañez, Valencia and Sagunto.- Teachesthe european social fund in the field of radio, with a openinghours of 900 hours, in which receives classes of training incontrol, journalism and programming, having been linked tothe stations during more than nine years. With young age, aenergia overflowing and some ever more large musicalknowledge starts to reside in clubs of levante, as HEAVEN(Valencia)-1990-91-, LIMIT ED LOCAL (Tarazona de laMancha)-1991-93-, ACT V FASHIONS (DJ of the pins of thepasses of clothing ACT V and festivals in premises thatrequest ACT V)-1992-96-, MELODY (Casas Ibañez)-1992-93--1997-99--2001-03,and in other as AEROPUERT O(Villarrobledo)-2001-, Complex OPEN T ECHNO SPACE(Fuentealbilla)-1994-95-, T ROPYKO (Requena)-2003-04-,GALAXY (Mazagon-Huelva) summers of 1996-97 and 99, inaddition to having been in infinity of hangouts in the area ofAlbacete, Cuenca, Castellon, Valencia, Alicante, Almeria andHuelva, in addition to having done bowling in chambers asSPOOK, ACT V, REVIVAL, PENELOPE, PACHA, SIGNUM,PASCHA (Mojacar), AT T IKA, SALA LOKIN DANGO,CLUBBERS, T HE LUXE, DIVINO etc. - Studied music theoryin music notation and fifth course of piano. Step onscenarios occasionally, acting behind groups such asDOVER, MACACO, ILEGALES, and many others whichdemonstrates the versatility and range of musical styles thatcan cover.-T he soul of their session is tec-house, helping in a principleof meeting of touches more house and vowels and theevening with touches minimalist, techno or techno-trance.T he poster of the party in which is now is who determinesits mode of click; working the mixer from only two channelsup to four and always helped by effects. "After having beenin several session endorsed, and heard on numerousoccasions, we can say that is a dj highly innovative, both inmusic, sounds as in the form to develop a sett, does notallow nor a single moment of relaxation, enjoys a techniquethat reveals what we understand by perfect and says anyserious -in the 1980S take full contact with the music, in the1990S to reconcile the mixtures and now learn to not tobreak speakers, je- Taken from interview of INERZ IAFM, thatthrough internet transmitting at world level. Specialremembrance of the session behind the group DOVER (year2004, which is where it adopts the nickname of "FRASH"and more than 12 thousand people delivered); and miradoresorg. held in the year 2003 in Berzosa de Lozoya (Madrid)project impressive created by former pupils (some of themalready enshrined) of Fine Arts in Madrid, subsidized by theCE, Project Leader and the Ministry of Agriculture, Fisheriesand Food, which in the edition of this year has beenreflected in television, the press of national daily, specialinformation in Radio programming 3 and in the prestigiousNosolomusica of T 5. 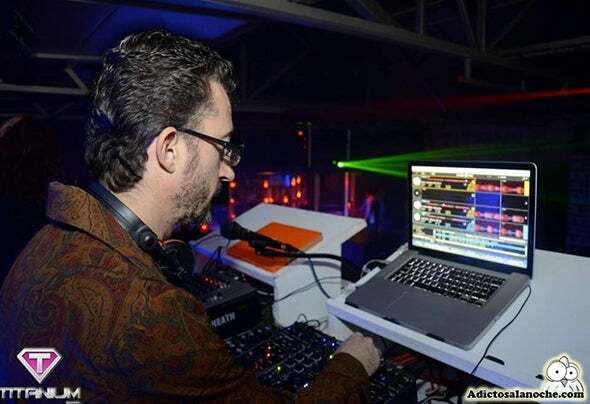 In addition to be responsible for thelast four hours of the mythical room Melody (today T heLuxe) that after twenty three years of existence and with thetwo chambers, already sanctioned by opening hours andfilled to bursting became the latest record, obviously withtears, since ahi died much of emotions; that made it the bestdiscotheque in Castilla La Mancha and best of Spain, clearin his time, and in its category.